Are Lower Power Costs on the Horizon? The cost of solar power has fallen exponentially over the past three decades, with some researchers predicting that if the current trend continues the renewable energy source could be half the price of coal by 2030. Scientific American reports that researchers have observed a principle similar to that of Moore's Law governing the pace of advances in solar energy. Where Moore's Law dictates that chip processing power doubles every 18 months, researchers from the National Renewable Energy Laboratory of the US Department of Energy have found similar logarithmic efficiency growth in the area of solar energy. 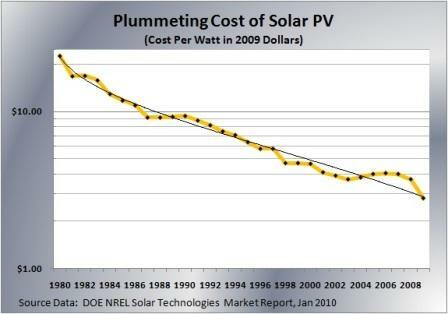 The dollar cost per watt of photovoltaic cells has fallen by 7% per annum on average over the past 30 years. The price per Watt of solar modules excluding installation has fallen from $22 dollars in 1980 to $3 at present, and data from 2010 indicates that solar prices are currently ahead of the three decade trend. These changes are driven primarily by ongoing cost reductions by experienced manufacturers and continual improvements in solar cell efficiency. Scientists have achieved solar efficiencies as high as 41% in lab settings, which were inconceivable at the start the 1980's. The exponential trend in solar watts per dollar has been going on for at least 31 years now. If it continues for another 8-10, which looks extremely likely, we’ll have a power source which is as cheap as coal for electricity, with virtually no carbon emissions. If it continues for 20 years, which is also well within the realm of scientific and technical possibility, then we’ll have a green power source which is half the price of coal for electricity.